A marketing research survey conducted by EgeBank in Istanbul, Turkey, focused on the importance of U.S. tour operators and travel agents’ perceptions of selected Mediterranean tourist destinations (Egypt, Greece, Italy. and Turkey), This study was conducted with the help of the Department of Tourism and Convention Administration at the University of Nevada-Las Vegas. The ANOVA table shows that “unpleasant-pleasant” and “distressing-relaxing” effective factors have Significant differences among the four destinations. 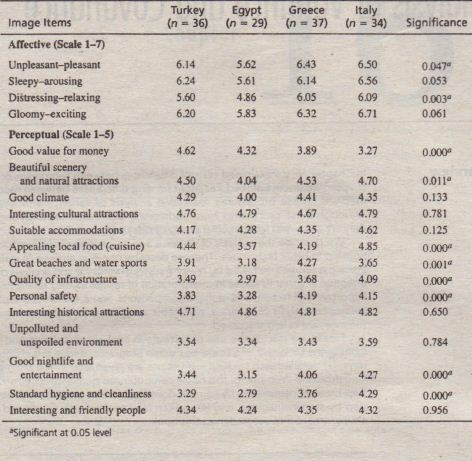 For instance, Greece and Italy were perceived as being significantly more relaxing than Egypt. As for the perceptual factors. eight of the 14 factors were significant. 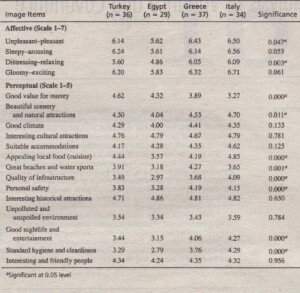 Turkey was perceived as a significantly better value for the mane) than Greece and Italy. Turkey’s main strength appears to be “good value;’ and the country’s tourism agencies should promote this in their marketing strategies On the other hand. Turkey needs to improve the perception of its infrastructure. cleanliness, and entertainment to encourage more tour operators and travel agencies in the Untied Stales to offer travel packages to Turkey. In 2007, 23 million tourists visited Turkey and tourism revenues amounted to US 18 billion. Analysis of variance was used to test differences in preferences for electronic shopping for products with different economic and social risks. In a 2 x 2 design, economic risk and social risk were varied at two levels each (high, low). Preference for electronic shopping served as the dependent variable. The results indicated a significant interaction of social risk with economic risk. Electronic shopping was not perceived favorably for high-social-risk products, regardless of the level of economic product risk, but it was preferred for low-economic-risk products over high-economic-risk products when the level of social risk was low. Despite the results of this study, the number of online shoppers continues to grow. As of 2008, more than 875 million consumers had shopped online, representing more than 80 percent of the world’s online population. The increase in shoppers can be attributed to bargain-seeking consumers, convenience of using the Internet, and, surprisingly, an added sense of safety associated with purchasing online. Improved Web sites, streamlined order taking and delivery, and assurances of more secure payment systems have increased the flow of new shoppers to the Internet while decreasing the traditional risk associated with online transaction purchases.? The tourist destination example presented a situation with four categories. The t test was not appropriate for examining the overall difference in category means, so analysis of variance was used instead. The electronic shopping study involved a comparison of means when there were two factors (independent variables), each of which was varied at two levels. In this example, t tests were not appropriate, because the effect of each factor was not independent of the effect of the other factor (in other words, interactions were significant). Analysis of variance provided meaningful conclusions in these studies. The relationship of analysis of variance to the t test and other techniques is considered in the next section. 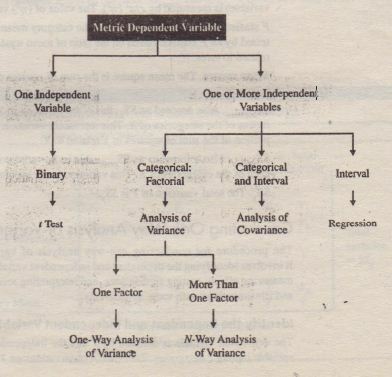 Analysis of variance and analysis of co-variance are used for examining the differences in the mean values of the dependent variable associated with the effect of the controlled independent variables, after taking into account the influence of the uncontrolled independent variables. Essentially, analysis of variance (ANOVA) is used as a test of means for two or more populations. The null hypothesis, typically, is that all means are equal. For example suppose the researcher were interested in examining whether heavy, medium, light, and nonusers of cereals differed in their preference for Total cereal, measured on a 9-point Likert scale. The null hypothesis that the four groups were not different in preference for Total could be tested using analysis of variance. In its simplest form, analysis of variance must have a dependent variable (preference for Total cereal) that is metric (measured using an interval or ratio scale). There must also be one or more independent variables (product use: heavy, medium,light, and nonusers). The independent variables must be all categorical (non-metric). Categorical independent variables are also called factors. A particular combination of factor levels, or categories, is called a treatment. One-way analysis of variance involves only one categorical variable, or a single factor. 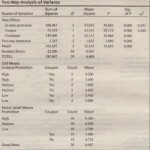 The differences in preference of heavy, medium, light, and nonusers would be examined by one-way ANOVA. 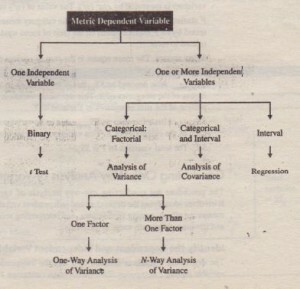 In one-way analysis of variance, a treatment is the same as a factor level (medium users constitute a treatment). If two or more factors are involved, the analysis is termed n–way analysis of variance. 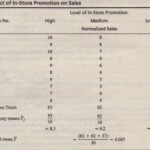 If, in addition to product use researcher also wanted to examine the preference for Total cereal of customers who are loyal and those who are not, an noway analysis of variance would be conducted. 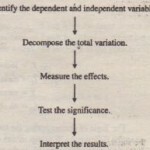 If the set of independent variables consists of both categorical and metric variables, the technique is called analysis of co-variance (ANOVA). For example, analysis of co-variance would be required if the researcher wanted to examine the preference of product use groups and loyalty groups, taking into account the respondents attitudes toward nutrition and the importance they attached to breakfast as a meal. The latter two variables would be measured on 9-point Likert scales. In this case, the categorical independent variables (product use and brand loyalty) are still referred to as factors, whereas the metric-independent variables (attitude toward nutrition and importance attached to breakfast) are referred to as covariates. variable. ANOVA and ANOVA can include more than one independent variable (product use, brand loyalty, attitude, and importance). Furthermore, at least one of the independent variables must be categorical, and the categorical variables may have more than two categories (in our example, product use has our categories). A t test, on the other hand, involves a single binary independent variable. For example, the difference in the references of loyal and non-loyal respondents could be tested by conducting at test. Regression analysis, like ANOVA and ANOVA, can also involve more than one independent variable. However, all the independent variables are generally interval scaled, although binary or categorical variables can be accommodated using dummy variables. For example, the relationship between preference for Total cereal, attitude toward nutrition, and importance attached to breakfast could be examined via regression analysis, with preference for Total serving as the dependent variable and attitude and importance as independent variables.